Crafted for use in cooking, Villa Manodori Artigianale Balsamic vinegar Di Modena is a blend of young and aged balsamic vinegar (10 to 20 years). Developed by Chef Massimo Bottura of Modena at the Villa Manodori, Chef Bottura uses"Artigianale" balsamic vinegar to prepare his dishes, from browning of pork to marinating fruit for dessert. It adds particularly rich flavor to sauces and marinades. Great for drizzling on parmigiano-reggiano cheese and fresh strawberries. Packed in an elegant white box this vinegar makes a great gift presentation. 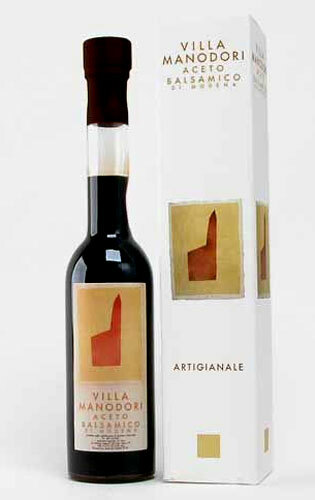 Villa Manodori balsamic vinegar, made in Italy.